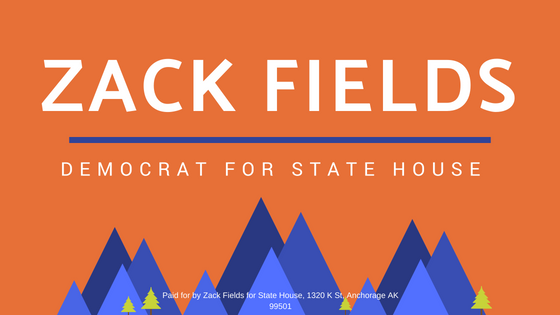 The Anchorage Central Labor Council has endorsed Zack Fields in the Democratic Primary for House District 20. Representative Les Gara, who represented the district for 16 years, is supporting Fields in the primary. "Zack Fields has a long record of fighting for working families, defending collective bargaining rights, and working to raise wages and improve workplace safety," said Dennis Knebel, president of the Anchorage Central Labor Council. "I am honored to have the support of my union sisters and brothers in this campaign," said Zack Fields. "Nothing is more important than economic security and opportunity for Alaska's working families. Unions are a cornerstone of our strong middle class, and throughout American history have played a central role advocating for civil rights and other important social reforms." Zack Fields previously worked as a Special Assistant and Workforce Development Coordinator for Alaska Labor Commissioner Heidi Drygas, and as a congressional aide with responsibility for labor policy. AFL-CIO President Vince Beltrami, Director of Operations Joelle Hall, Laborers Local 341 Business Manager Joey Merrick, and IUPAT Local 1959 Business Manager Bronson Frye had previously endorsed Fields.